After a record-breaking festive period, fruit and vegetable sales in Ireland grew €7 million year-on-year in January, a new report from Kantar Worldpanel has revealed. The sales of vegetable side dishes, vegetarian sausages and burgers collectively rose by 35%, and the sales of plant-based milk were 40% higher when compared with January 2018. However, the period also witnessed customers tightening their purse strings on household purchases. 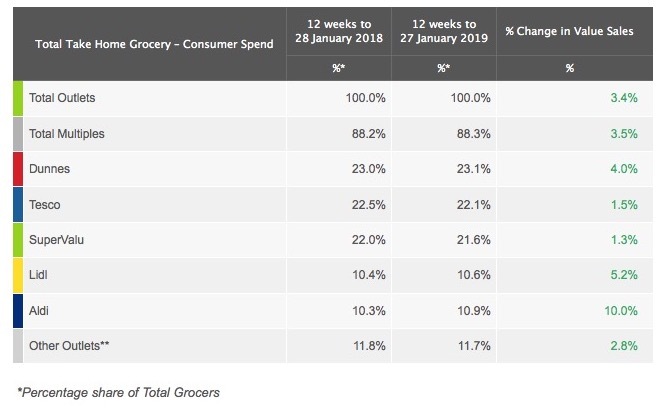 Douglas Faughnan, consumer insight director at Kantar Worldpanel, commented, "The average household spent €120 less on groceries during the four weeks to 27 January than in December. "Shoppers were less likely to reach for more expensive branded and premium products, with sales falling 28% and 31% compared with December 2018." Overall, the Irish grocery market reported a year-on-year sales growth of 3.4% during the 12 weeks to 27 January. Dunnes Stores emerged as the only retailer to gain market share during this period, seeing its sales grow by 4%. In addition, Aldi and Lidl continued their strong performance, by attracting more than 70% of Irish households during the past 12 weeks. Sales at Aldi increased by 10%, while Lidl posted a growth of 5.2%. Tesco and SuperValu, meanwhile, achieved sales growth of 1.5% and 1.3% respectively. This was driven by sales of private-label ranges in Tesco, and branded products in SuperValu. Despite the notion of 'Dry January' dominating headlines and social media feeds, more than a third of Irish households bought either beer, cider or wine in January, according to the report. Wine emerged as the most popular beverage with 25% of shoppers buying at least one bottle in the past four weeks.